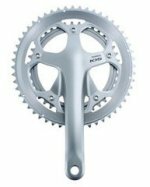 This is the range of Shimano 105 Chainsets offering good value for road going use, using Hollowtech Shimano technology - forged aluminium cranks to keep stiffness while reducing weight. Available in double and triple sets. The 105 5603 makes pro level technology available, featuring: HOLLOWTECH II crankset : Optimum balance of lightweight and rigidity. Q-factor : Q-factor remains same as FC-5502 / FC-5505 / BB-5500. Smoother rolling : Minimal bearing interface for smoother rolling. Hyperdrive compatible (SG-X chainrings). DUAL SIS compatible. Gearing : 50-39-30T(FC-5603). Crank arm length variations : 170mm, 172.5mm, 175mm. Available in Silver or Black.